Here's one for fans of the Sport of Kings - an online slot that celebrates a day at the races, with an arcade mode that adds to the usual smack 'n' spin mindless gameplay you usually get with many inferior slots. In Scandinavian slot developer NetEnt's Champion of the Track you get a 5 reel, 30 pay-line slot with a couple of interesting arcade-style elements to brighten up gameplay. You'll notice a 'Career Tracker' snaking around the reels. If you make it all the way round you'll win a Champion of the Track bonus. There are also 'Cup wins' bonuses too for passing landmarks stops on the track. Filling the reels in the base game are everything you'd expect from a racecourse: horses, of course, plus their jockeys, punters, finishing lines, rosettes, gold cups, horseshoes and binoculars. The jockey is the Wild, and he substitutes for all symbols other than the Racehorse Scatter and Bonus symbols. But back to the Champion of the Track bonus. How can you bag the big bucks? There are a number of ways, starting with the game's big bonus round. You can win three steps along the career ladder if your horse comes in first during the bonus round race. This is awarded when three or more bonus icons appear and requires you to back a horse which then competes in a virtual race. You can win bonus cash and steps along the career path for a successful choice. 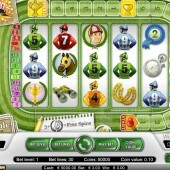 Other ways to progress along the Career Track are to hit the free spins round, where you can win up to 4 career steps. There are also bonus steps to be won in the free spins round by hitting more Scatters. Three Racehorse scatters will award 10 free spins with a 2x multiplier. What's even better is that your progress along the track is maintained on the game for 48 hours, so you can pop in and out on your quest for glory without losing your position. The designers have been clever in their use of icons by switching out numerals and letters for Jockeys wearing different jerseys. Other icons include horses, sports sheets, gold cups, binoculars, horseshoes and rosettes. 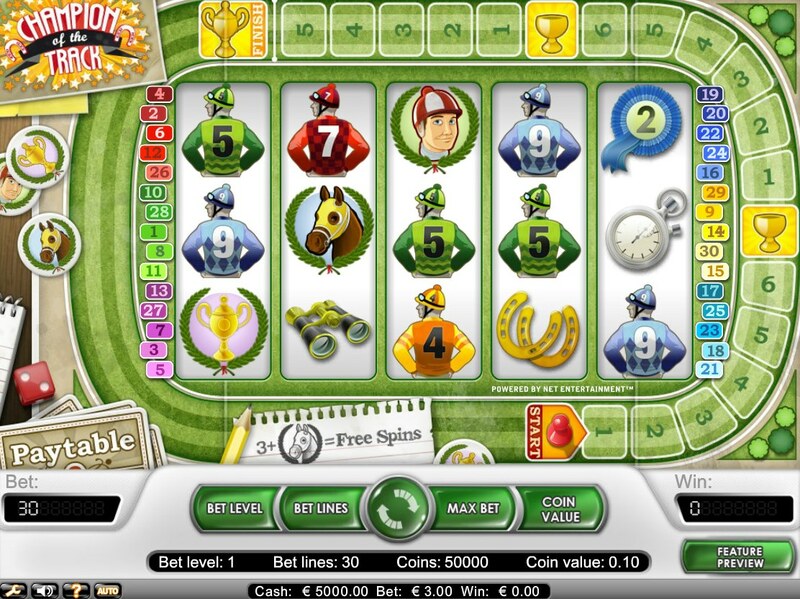 Very similar to Playtech's horse racing-inspired slot, Frankie Dettori's Magic Seven, and with some big jackpots and an arcade-style bonus round, it's probably closest to Champion of the Track in feel.